St. Augustine might not pop into your mind when you think “destination wedding,” but maybe it should. The gorgeous city is awash with one-of-a-kind attractions and it drips with historical significance. It also happens to be packed with tons of unconventional and breathtaking places to get married. If the typical churches and venues aren’t capturing your imagination, check out these truly unique wedding venues in St. Augustine. Country chic is an immensely popular wedding theme now, and you’ll understand why when you see Tringali Barn. The rolling green fields, the shimmering lake, the classic red barn; everything about this countryside venue looks ripped straight out of a fairy tale. For elegance with a touch of country, Tringali Barn is your spot. Villa Zorayda cuts a striking figure the moment you see its Spanish-inspired architecture towering over the landscape. It’s within this enchanting museum you can celebrate your nuptials surrounded by exotic flair. Inspired touches like the beautiful horseshoe arches and romantic hanging brass lamps will give you and your guests a wedding experience like no other. Okay, we can hear you sighing already. But believe it or not, this venue isn’t just for golf fanatics (though it doesn’t hurt to love the game). Indeed, the natural beauty of the golf course and golden sunset serve as a picturesque backdrop for your special day. Unique landmarks like the Pool of Unity even makes for eye-popping photo opportunities. Located in historic downtown St. Augustine, The White Room offers a few different venue options, each more beautiful than the last. There’s the Grand Ballroom with its classic wedding vibes or the crisp Villa Blanca, which evokes the purity and sanctity of the moment. Then there’s The White Room’s rooftop venue, providing stunning waterfront views to accompany your ceremony. No matter which option you choose, you’ll end up with one of the most captivating and unique wedding venues in St. Augustine. For a truly ornate wedding celebration, check out Lightner Museum. The venue was originally built in 1888 by Henry Flagler as the grand Hotel Alcazar. In the century-plus since its inception, it’s transformed from flashy hotel to one of the best collections of fine 19th century art in the country while still retaining the exquisite elegance that sets it apart. It’s also a surprisingly versatile wedding venue with multiple indoor and outdoor spaces. In a city full of unique wedding venues, Marineland might be St. Augustine’s most one-of-a-kind wedding destination. At this oceanfront playground, you can celebrate your special day with a few extra special guests: the famous Marineland dolphins. Marineland offers three different packages to accommodate large and intimate weddings as well as elopement ceremonies. 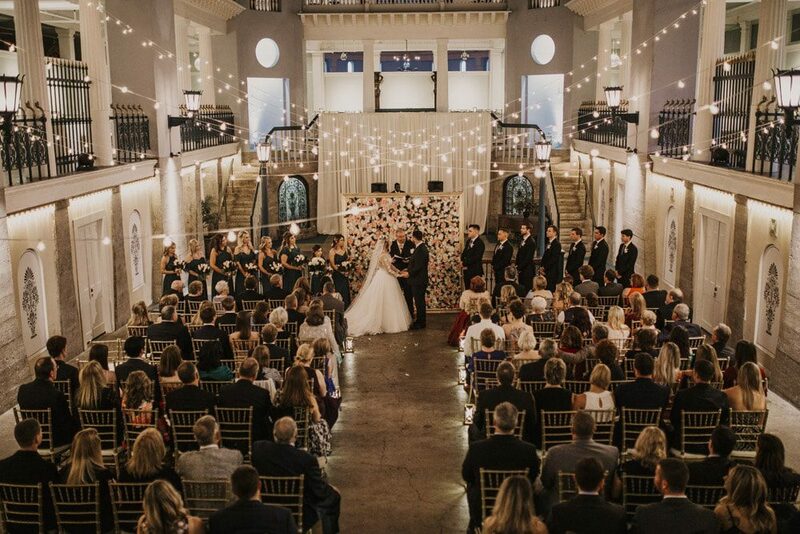 There are historical wedding venues, then there’s The Treasury on the Plaza, a veritable time capsule ready to transport you several decades into the past for an unforgettable wedding celebration. Situated in the very heart of St. Augustine, The Treasury initially opened in 1927 as the area’s central bank. The iconic giant vault doors and classic architecture have since been remodeled to play host not to money, but to ceremonies where memories are made. You can see for yourself just how striking The Treasury is in the photo at the top of this post, courtesy of wedding photographer Ken Thomas. If the Fountain of Youth can grant you eternal youth, then it can certainly grant your marriage eternal goodwill. At the very least, the fountain and its surrounding archaeological park can serve as a magical setting for your wedding. Views of the Matanzas River and the sight of native exotic peacocks wandering the grounds will transport you to a dream world as you join your soul with another. One of St. Augustine’s most iconic attractions can also play host to your special day. Castillo de San Marcos, the famous St. Augustine fort, presents a unique venue space: you and your spouse will exchange I do’s in the verdant lawn overlooking pristine water views. You’ll also be able to capture wedding photos amid the historical beauty of the fort itself. The fort’s historic significance means you’ll need a permit to host your wedding there, but it’s well worth the effort.